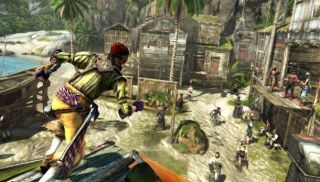 "Too much pirating, not enough assassinating," is one of the possible reactions to any of Assassin Creed IV: Black Flag's thirteen bajillion trailers so far. Not from me, of course, because I think high-seas looting sounds great. For those of a more stabby inclination, here's the video you've been waiting for. This multiplayer trailer is packed full of violence. And also the band Black Rebel Motorcycle Club, for some inexplicable reason. Those who've dipped into the AC games' surprisingly good multiplayer will recognise much here. That's not necessarily a bad thing: hunting down prey, while simultaneously trying to make your hunter think you're an AI NPC, is a pleasant enough way to spend some time. Assassin's Creed IV: Black Flag is out November 1st.